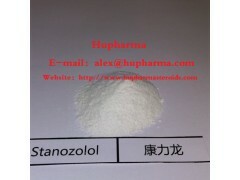 Shenzhen Hupharma Industry Co., Ltd.
1.Stanozolol is a popular name for the anabolic steroid stanozolol. This compound is a derivative of dihydrotestosterone, although its activity is much milder than this androgen in nature. It is technically classified as an anabolic steroid, shown to exhibit a slightly greater tendency for muscle growth than androgenic activity in early studies. 2.While dihydrotestosterone really only provides androgenic side effects when administered, stanozolol instead provides quality muscle growth. The anabolic properties of this substance are still mild in comparison to many stronger compounds, but Stanozolol is still a ggod, reliable builder of muscle. Its anabolic properties could even be comparable to Dianabol, but Winstrol does not have the same tendency for water retention. Stanozolol also contains the same c17 methylation we see with Dianabol, an alteration used so that oral administration is possible. To spite this design however, there are many injectable versions of this steroid produced. 3.Since Stanozolol is not capable of converting into estrogen, an anti-estrogen is not necessary when using this steroid, gynecomastia is not a concern even among the most sensitive individuals. 4.Since estrogen is also the cause of water retention, instead of bulk look, Stanozolol produces a lean, quality look with no fear of excess subcutaneous fluid retention. This makes it a great steroid to use during cutting cycles, when water and fat retention are a major concern. It is also very popular among athletes in combination strength/speed sports such as Track and Field.